LONG BEACH, Calif. (AP) — A 3-week-old girl was missing Sunday from a California home where the baby's mother, father and uncle were found shot, police said. Long Beach police were seeking an adult male in the shooting but have not said if the man is related to the missing infant. His motive was unknown but detectives do not believe the shooting was a random act, police spokeswoman Marlene Arrona said. Officers went to the residence Saturday evening after receiving a call about the shooting and found the two brothers and the baby's mother with gunshot wounds, she said. One of the brothers is the father of the child. Two victims remained hospitalized in critical but stable condition. The other was treated and released. 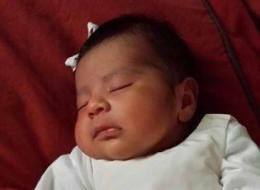 The 10-pound baby girl, named Eliza Delacruz, is the focus of an urgent police search. Authorities asked anyone who knows of someone bringing home an infant under suspicious circumstances to call the police or take the child to a police station, hospital or fire station. Police released a photo that showed the child sleeping on a red blanket in a ruffled white dress with a white bow in her hair. Admin UPDATE: Sadly, this is now a murder investigation: Anyone with information is urged to call Long Beach Homicide Detectives Donald Goodman and Mark Mattia at (562) 570-7244. Anyone wishing to remain anonymous may call 1-800-222-TIPS (8477), or text TIPLA plus your tip to 274637 (CRIMES), or visit www.lacrimestoppers.org. I knew about this case since yesterday but with just a baby's photo and not much to work with I wanted to see if there'd eventually be a named suspect to look for. A day later and still no known suspect, so I couldn't wait any longer for this breaking news case. If they do eventually have a named suspect, I'll make a thread for him. Tragic end. Eliza's body has been found in a dumpster. Cause of death has not been released so not officially a homicide et even though it seems pretty obvious. Once they say it is, I hope they find the monster that did this. If not, I'll move this case to the exclusive unsolved murders section. Unsurprisingly, but still tragic, this is now a murder investigation, so this case has been moved to the Exclusive Unsolved section. Three people have been charged with Eliza's murder- including the main person believed responsible- according to police a woman who wanted to convince her husband she had given birth to twins but needed to find infants of appropriate age hired accomplices to carry out the kidnapping. Unbelievable.